"You're locked into this life; your body is like a straitjacket, binding you to the world." It all started as a simple game. Helen and Ellie, young twin sisters, decided to play a trick on their mother. Helen, the smarter and more popular of the two, suggested that they trade wardrobes and pretend to be each other. The plan worked brilliantly. Their mother did not notice the switch and the sisters successfully embodied their counterpart. But there was one major flaw in the game. Ellie really liked being Helen. So much so, in fact, that she refused to go back to being herself. Fast forward many years and Helen, now going by the name Smudge, is a woman trapped in a life that was never supposed to be hers. With Ellie (Hellie) excelling in her role as Helen, Smudge is trapped in the downward spiral of her sister's underachieving world. Unnoticed and unloved by her family, Smudge drifts through her life with resent and a general disregard for her own well being. All of that changes when Smudge receives word that her sister has gone into a coma. After years of no contact with her family, Smudge is thrust back into the world that she's tried so hard to escape. Can she finally convince her family that their whole lives have been a built around a childhood deceit? Is is too late to put the past behind her and live her life as the person she was born as? 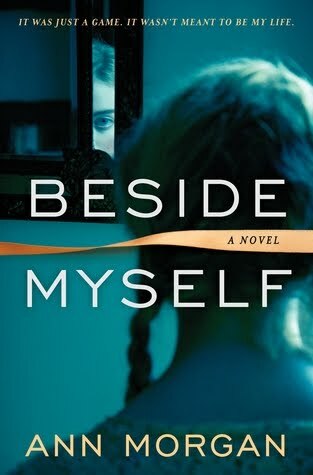 In her debut novel Beside Myself, author Ann Morgan writes a dark and haunting psychological thriller that explores the importance of personal identity. The situation is deeply disturbing and could easily have become laughably unbelievable. Fortunately, Morgan layers each of her characters with a tinge of sadness that brings an authenticity to the entire narrative. The emotional character arcs are weaved into the quick moving thriller, making the novel an engaging and easy read. Beside Myself is a novel that fires on all cylinders and marks a promising start to its author's career. To enter for a chance to win a copy of this novel, use the Rafflecopter widget below. Open to US residents, no PO boxes please. Ends 2/9. Winner will have 48 hours to respond after being contacted. This entry was posted on Tuesday, January 26, 2016 and is filed under Ann Morgan,Beside Myself,Bloomsbury,Giveaway,Psychological Thriller,TLC Book Tours,Twins. You can follow any responses to this entry through the RSS 2.0. You can leave a response. Who can resist the level of intrigue and mystery suggested by this review? Unique plot and am now curious about the resolution. What a spooky concept, can't wait to see what happens. Thanks for the chance to win a copy. After reading a sample of this book I am dying to find out what happens. I have just seen this one featured on another bloggers site and it interested me so much that I want to read it myself. It seems like the theme of identity is pretty important here, and that's something I hold especially close to my heart as well.